Helpful info for Climbing Mount Damavand 5671m. 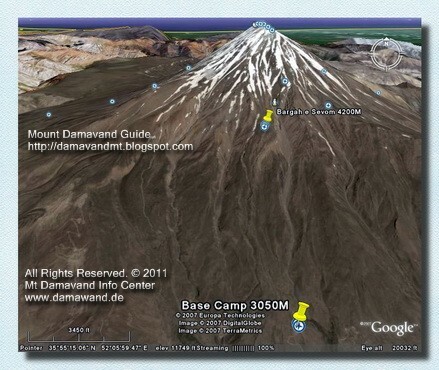 It is a good idea to have a virtual trip to Damavand by GoogleEarth before you actually start climbing. It gives you an impression about the area, route, places and answers some of your questions. All you need is Google Earth software installed on your PC, labtop, smart mobile phone, or your pocket pc and the following placemark files. Just click on the landmark files which you are interested in, and you go there in few moments! There are some interesting useful photos/images to help you. 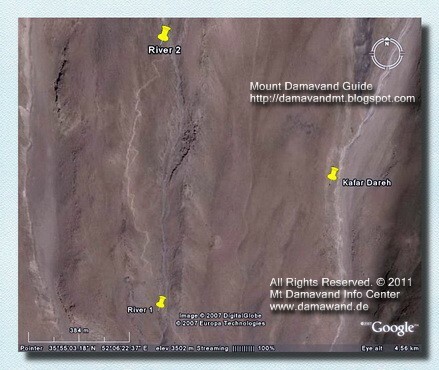 Googleearth Karte Mount Damavand Iran. Virtuelle Reise Damawand. Wesentliche GPS Sehenswürdigkeiten zum Wandern Trekking iran Berge. Klettertouren und Skitouren Teheran. Skitouren zu Alborz und Zagross Mountains. Mountainerring und Outdoor-Aktivitäten Touren Iran. Teheran Satellitenbildkarte. Demawand Google Earth Karten. GPS-Wahrzeichen und Gleistrasse und Wanderkarte. Persischen kulturellen und historischen touristischen Stätten. Teheran Trekking-Expedition Tour 2013 Demavand Karte. Low-Budget-Tour. GoogleEarth map mount Damavand Iran. Virtual trip Damawand. Essential GPS landmarks for hiking trekking iran mountains. Climbing tours and skitouring Tehran. Skitours to Alborz and Zagross Mountains. Mountainerring and outdoor activities tours Iran. Tehran satellite image map. Demawand Google Earth maps. GPS landmark and track route and trail map. Persian cultural and historical tourism sites. Tehran trekking expedition tour 2013. Demavand Map. Low budget tour. Mapa GoogleEarth montaje Damavand Irán. Viaje virtual Damawand. Esenciales GPS hitos para ir de excursión de trekking montañas Irán. Escalada excursiones y skirando Teherán. Skitours a Alborz y montañas Zagross. Mountainerring y actividades al aire libre Giras Irán. Teherán mapa de imagen de satélite. Demawand los mapas de Google Earth. Hito GPS y trazado de las vías y mapa de los senderos. Sitios de turismo cultural e histórico persas. Teherán senderismo gira expedición 2013. Demavand Mapa. Gira bajo presupuesto. 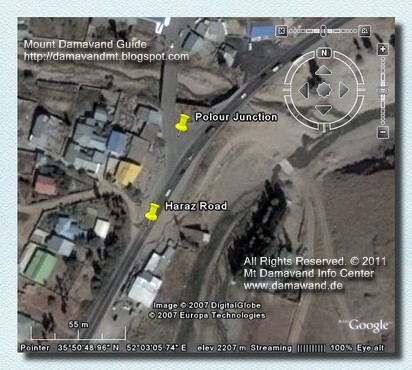 Carte GoogleEarth Mont Damavand Iran. Voyage virtuel Damawand. Repères GPS essentielles pour la randonnée de trekking montagnes iran. Escalade Tours et Randonnées à Téhéran. Skitours à Alborz et Zagross Montagnes. Mountainerring et activités de plein air Tours Iran. Téhéran image satellite carte. Demawand cartes Google Earth. Repère GPS et la piste itinéraire et carte des sentiers. Sites touristiques culturels et historiques persans. Téhéran trekking expédition 2013. Demavand Plan. Visite à petit budget. 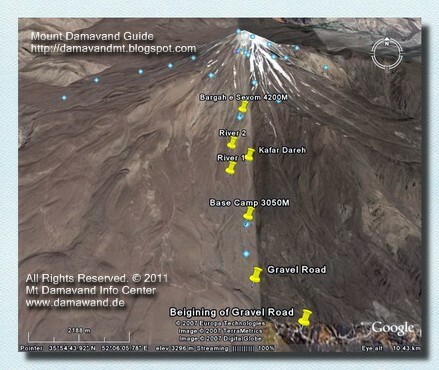 GoogleEarth mappa Monte Damavand Iran. Viaggio virtuale Damawand. Essenziali punti di riferimento GPS per escursioni di trekking sulle montagne dell'Iran. Arrampicata escursioni e sci alpinismo Teheran. Sci alpinismo a Alborz e Zagross Montagne. Mountainerring e attività all'aria aperta tours Iran. Tehran mappa immagine satellitare. Demawand mappe Google Earth. Punto di riferimento GPS e via pista e Mappa dei sentieri. Siti di turismo culturale e storico persiani. Teheran Trekking Tour spedizione 2013. Demavand Map. Tour Low budget. Googleearth Kart Mount Damavand Iran. Virtuell tur Damawand. Essential GPS landemerker for fotturer trekking iran fjell. Klatreturer og skitouring Teheran. Skigåere til Alborz og Zagross Mountains. Mountainerring og friluftsliv turer Iran. Teheran satellitt bildekart. Demawand Google Earth kart. GPS landemerke og spor rute og løypekart. Persiske kulturelle og historiske turisme områder. Teheran trekking ekspedisjon tour 2013. Demavand kart. Lavt budsjett tur. GoogleEarth карту Демавенд Иран. Виртуальное путешествие Damawand. Основные достопримечательности GPS для Туризм треккинг Иран горы. Восхождение туры и skitouring Тегеран. Skitours к Эльбрус и Zagross горы. Mountainerring и мероприятия на свежем воздухе туры в Иран. Тегеран Карта спутниковых изображений. Demawand карты Google Планета Земля. GPS достопримечательностью и проделанный маршрут и след карту. Персидские культурные и исторические туристических объектов. Тегеран экскурсии экспедиции туристам 2013. Demavand Map. Низкий бюджет тур. GoogleEarth kartu Demavend Iran. Virtual'noye puteshestviye Damawand . Osnovnyye dostoprimechatel'nosti GPS dlya Turizm trekking Iran gory. Voskhozhdeniye tury i skitouring Tegeran . Skitours k El'brus i Zagross gory. Mountainerring i meropriyatiya na svezhem vozdukhe tury v Iran . Tegeran Karta sputnikovykh izobrazheniy . Demawand karty Google Planeta Zemlya . GPS dostoprimechatel'nost'yu i prodelannyy marshrut i sled kartu . Persidskiye kul'turnyye i istoricheskiye turisticheskikh ob"yektov . Tegeran ekskursii ekspeditsii turistam 2013. Demavand Map. Nizkiy byudzhet tur .